A trilateral agreement pledges collaborative implementation of science-based conservation initiatives that secure and connect jaguars and their habitats in Belize and beyond its borders, facilitate land development that is both ecologically sustainable and economically profitable, and mitigate human-jaguar conflict throughout the country. Panthera is leading an ambitious effort to establish a safe jaguar corridor from Mexico to Argentina. : Photograph by Steve Winter courtesy of Panthera. New strides for the future of the jaguar were made at the end of February 2014 with the signing of a critical conservation agreement between the government of Belize, Panthera, a global wild cat conservation organization, and the Environmental Research Institute (ERI) of the University of Belize. This trilateral agreement represents a pledge by all parties to collaboratively implement science-based conservation initiatives that secure and connect jaguars and their habitats in Belize and beyond its borders, facilitate land development that is both ecologically sustainable and economically profitable, and mitigate human-jaguar conflict throughout the country. 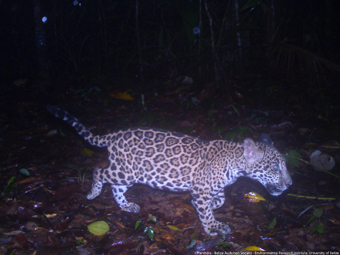 A jaguar cub caught on camera in Belize’s Cockscomb Basin Wildlife Sanctuary. : Photograph©Panthera“The signing of this historic agreement epitomizes conservation action and partnerships coming full circle,” Dr. Rabinowitz explained. Panthera’s Vice President, Dr. George Schaller, and Dr. Howard Quigley, Director of the Jaguar Program, began the first comprehensive, ecological study of jaguars in the Brazilian Pantanal in the late 1970's. Almost a decade later, Dr. Alan Rabinowitz, Panthera’s CEO, radio-collared the first jaguars in Belize, leading the country to establish the world’s first jaguar preserve and Belize’s first wildlife protected area – the Cockscomb Jaguar Preserve. “Nearly thirty years ago, I studied the jaguars of Belize, and today we return to the birthplace of jaguar research and conservation to reignite and strengthen the commitment, strategy and resources required to ensure this species lives on, for the next thirty years and beyond, ” said Dr. Rabinowitz. His studies illuminated new insights into the ecology of the species, and setting the stage for subsequent research which demonstrated that Belize’s Cockscomb Basin contained the highest density of jaguars ever recorded at the time, anywhere in the wild. This research was instrumental in establishing the world’s first jaguar preserve in 1986 – the Cockscomb Basin Wildlife Sanctuary. “The jaguar is an iconic species of Belize,” said Belize’s Minister of Forestry, Fisheries & Sustainable Development, the Honorable Senator Lisel Alamilla. “Their survival is dependent on our willingness to seek solutions that balance human interest and protection of their habitat. I am convinced that Belize, along with all its partners, can find win-win solutions for us to co-exist." Jaguars use and require Protected Areas, but they move beyond them in search of food, space, and in order to breed, to pass: along their genes into the future. Panthera’s Jaguar Corridor Initiative aims to link core jaguar populations within the human landscape from northern Argentina to Mexico, preserving their genetic integrity so that jaguars can live in the wild forever. Photograph by Steve Winter courtesy of Panthera. Panthera’s Jaguar Corridor Initiative (JCI) is the largest and most effective carnivore conservation program in existence; spanning nearly six million square kilometers, the JCI seeks to connect and protect jaguar populations from Mexico to Argentina to ensure the species’ genetic diversity and survival. Belize is one of 13 countries with which Panthera is implementing strategic jaguar conservation science, and now, along with Belize, Panthera has solidified MOUs in Latin America with the governments of Panama, Guyana, Costa Rica, Honduras and Colombia. 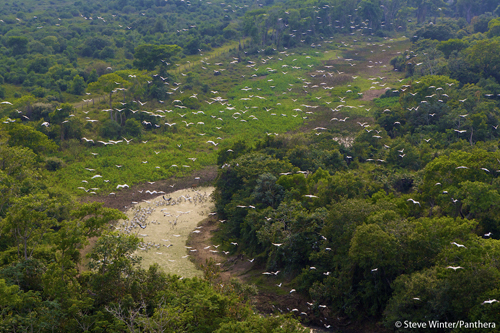 The Pantanal ecosystem is one of the most biologically rich environments in the world. By conserving jaguars,: the Pantanal Jaguar Project is also protecting the unique Pantanal ecosystem and the thousands of bird, plant, fish, mammalian, reptile and other species that share their home with the jaguar. Photograph by Steve Winter courtesy of Panthera. “Our team will continue to work, country by country, to build partnerships with all nations home to the jaguar, connecting and protecting the entire eighteen-nation mosaic that is the jaguar’s range,” Dr. Rabinowitz said. Buttressing the southern tip of Mexico and eastern border of Guatemala, Belize serves as an integral link connecting jaguars within these countries, and all jaguar populations south of Belize. As a stronghold for jaguars in Mesoamerica, Belize is also highly unique in that it protects a greater proportion of land (43%) through national parks and private reserves than any other nation in Central America. Panthera’s jaguar conservation initiative in Cockscomb and the Maya Mountains is the world’s longest-running scientific study of the species’ population dynamics, ecology and behavior. A testament to the strict and effective protections afforded for the species, Cockscomb still shelters one of the highest densities of jaguars anywhere in the wild. 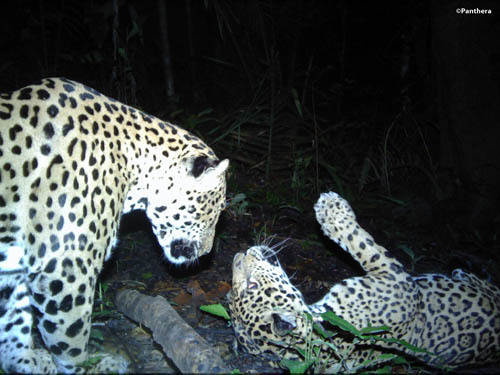 Panthera’s unique camera trap data has documented the presence of 131 jaguars in the Cockscomb study area over 11 years, and uncovered new findings about the species, among them that wild jaguars can live at least 13 years. Since 2008, Panthera has also partnered with the Ministry of Forestry, Fisheries and Sustainable Development, ERI and Belize Audubon Society to implement environmental education projects, monitor jaguar populations and their prey, reduce jaguar-livestock conflict, and maintain critical connectivity of these populations in and between the Central and Southern Belize Corridors, which touch the borders of Mexico and Guatemala. The Brazilian Pantanal is home to the highest density of jaguars in the world. Panthera is ensuring the future: of these jaguars by creating a protected jaguar corridor, conducting extensive ecological research, and partnering with local ranchers to interweave jaguar conservation and cattle management practices within the Pantanal. Photograph by Steve Winter courtesy of Panthera. “This MOU will result in strategic action plans to reduce tension among humans and wildlife and allow us to better contribute to the sustainable development of Belize,” said University of Belize Interim President, Dr. Wilma Wright. The jaguar (Panthera onca) is the third largest cat in the world, after the tiger and lion, but it is the largest feline: in the Western Hemisphere. During the 1960’s and 1970’s, the jaguar was heavily hunted for its beautiful coat. As many as 18,000 wild jaguars were killed each year until the Convention on the International Trade in Endangered Species (CITES) of 1973 brought the pelt trade to a near halt. Today, jaguars continue to be hunted due to conflict with humans who live in fear of them, or view them as a threat to their livelihoods. Photograph by Steve Winter courtesy of Panthera. “Jaguars, like many large, free-ranging wildlife species, are not constrained by political boundaries, nor are they as challenged as we might think by physical ones. 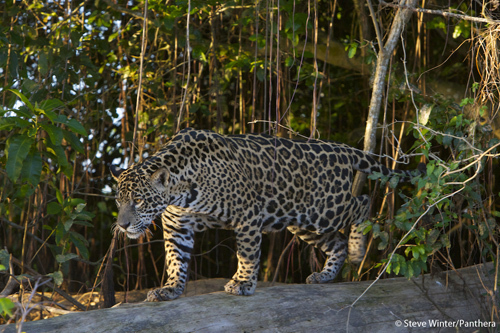 Jaguars use and require protected areas, where their core populations can thrive. But they move beyond protected areas, through landscapes, across rivers and canals, over hills and mountain passes; even through marginally developed areas, in search of food, space, and security, and in order to breed, to pass along their genes, into the future. Taken in late 2012 by Panthera’s research collaborator, Ailton Lara of Pantanal Nature Tours, this video features Noca – the first female jaguar collared as part of Panthera’s Pantanal Jaguar Project – playing with her new mate, a resident male jaguar, in the Brazilian Pantanal. Panthera’s jaguar scientists first collared Noca in late 2010 when the CBS ’60 Minutes’ crew was on location to document Panthera’s innovative jaguar conservation work in the Pantanal. Noca’s collaring was later aired on the ’60 Minutes’ program, In Search of the Jaguar: Up Close and Rare, in January of 2011. In February 2013, ’60 Minutes’ aired an update on Noca’s latest activities, including the birth of at least one new cub. After this cub dispersed, the video above was filmed of Noca with her new mate, preparing for another litter. Click here to watch the one minute ’60 Minutes’ update. “A jaguar corridor is a cattle ranch, a citrus plantation, someone’s backyard – a place where jaguars can pass through safely and unharmed. Panthera’s Jaguar Corridor Initiative seeks to realize this vision of linking core jaguar populations within the human landscape from northern Argentina to Mexico, preserving their genetic integrity so that jaguars can live in the wild forever. “Through multilateral partnerships, government support, and local buy-in, Panthera is the driving force behind this unique initiative, ensuring safe passage for the majestic and mysterious jaguar across its entire range. 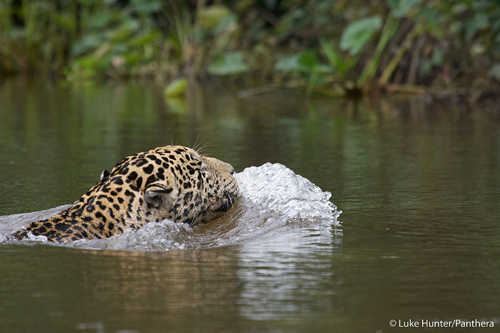 This crystal clear video shows a male jaguar walking in the Brazilian Pantanal. If you are in awe of this incredible species, like we are, educate yourself about what Panthera is doing to protect jaguars through the Pantanal Jaguar Project & consider making a contribution to support this program. 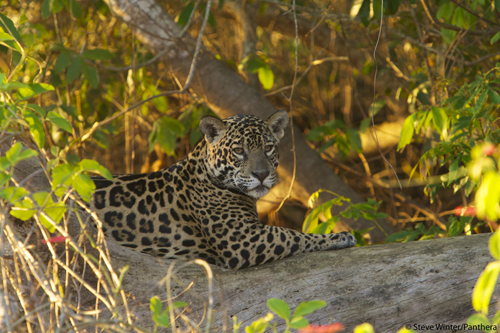 Read about the Pantanal Jaguar Project. 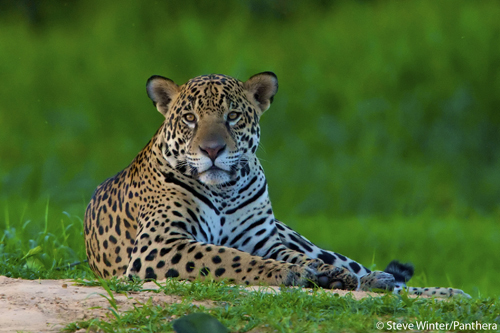 Learn more about the Key Activities of the Jaguar Corridor Initiative. Panthera works in 13 of the 18 jaguar range states. Click here to read more about the work Panthera is doing in these countries. 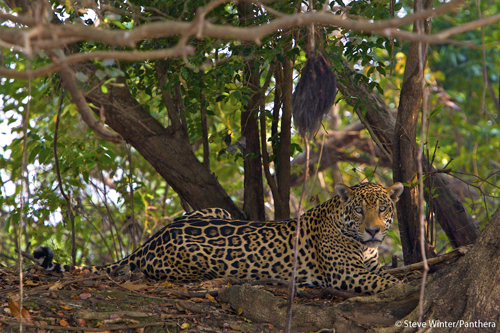 Read Panthera's Jaguar Report Card: The State of the Jaguar. 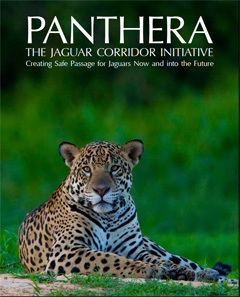 Please check back shortly for more detailed information on each country in which Panthera is implementing the Jaguar Corridor. Unless otherwise indicated, the information and the images in this article are courtesy of Panthera. This article was published on the Horizon International Solutions Site on 14 March 2014.